The silence on the persecution of Chinese Catholics and their bishops in Wenzhou and Shanghai. The organisms that Benedict XVI did not accept (Patriotic Association and Chinese Bishops' Conference) because "incompatible with Catholic doctrine" now govern the Church. Dialogue between China and the Vatican must address the issue of underground bishops out in the open and not under the shroud of secrecy. An analysis from a northeast Chinese Catholic, as the Vatican celebrates a new round of China-Holy See talks. Rome (AsiaNews) - Marking the 10th anniversary of the Letter from Benedict XVI to Chinese Catholics, we received this analysis from a Catholic in northeastern China, named Joseph. In it he traces these 10 years evidencing how - though Pope Francis has proclaimed it still relevant and valid - the facts show that it is being betrayed bit by bit. Citing facts and situations, the author also points out how the power of the Chinese government is increasingly determining the life of the Church and appointing bishops, choosing and ordaining candidates who live in "gray pragmatism" (Evangelii Gaudium, 83). Joseph also complains that there is too much silence on persecution as bishops, priests and lay people endure in China and fear that the talks between China and the Vatican - a session of which took place June 20-21 in the Vatican - will lead to the elimination of the unofficial Church. To allow for a better understanding of the facts, the interactive links posted by the editorial team refer to the news items they reference, published on AsiaNews. Recently, following the fourth detention of Bishop Shao Zhumin, Bishop of Wenzhou, his condition caught the attention of the German ambassador to China and many people in the country and abroad. Additionally, this year marks the 10th anniversary of Pope Benedict XVI’s Letter to Chinese Catholics and the 5th anniversary of the forced house arrest of Bishop Ma Daqin July 7, 2012. It is the perfect occasion to briefly review recent Church events in China. Ten years ago, Pope Benedict XVI published his famous Letter to Chinese Catholics, in which he indicated that some bodies, which were placed above the Church, namely the Chinese Patriotic Association and the Episcopal Conference [called "Yi hui, yi tuan" , One Association, One Conference-ndr], are incompatible with the specific nature of the Catholic Church. The Pontifical Letter aroused a strong reaction. Later, the Holy See also published a Compendium of the same Letter. Nine years after its publication, Pope Francis acknowledged that the Letter still guides the Church's affairs in China. In addition, two initiatives continued with the Letter: the first, the observance of May 24 as the Feast of Our Lady of Help of Christians and the Day of Prayer for the Church in China and Pope Benedict’s special prayer to Our Lady of Sheshan for this purpose. The second initiative is that the Holy See has formed a permanent study commission, which gathers in secret at regular intervals to consider the problems of the Church in China and the relations between China and the Vatican: its official statements have expressed concerns and remonstrations against cases in which the Beijing authorities had obviously forced [the so-called] democratic episcopal ordinations. Yet 10 years later, when Pope Francis recalled the Day of Prayer of the Universal Church for the Church in China, the offices of the Holy See no longer mention the Letter of the Emeritus Pope or that the Special Commission has been suspended without reason. With regards the Church in China, five years ago, at the episcopal ordination of the auxiliary bishop of Shanghai, Msgr. Ma Daqin (Beijing’s One Association and One Conference appointed him as coadjutor bishop), during the ceremony, he refused the imposition of the hands of an illegitimate bishop and after the blessing stated that he was withdrawing from the Patriotic Association. This fact went down in history as 'the change of July 7'. Bishop Ma Daqin’s gesture was welcomed with a huge applause both in China and abroad. But at the same time, led the Diocese of Shanghai to paralysis, sheep without a shepherd, which is still the case even today. Bishop Ma has been put under compulsory house arrest for five years, and even nowadays cannot exercise his episcopal ministry. The Vatican does not consider the only existing bishop in Shanghai as ordinary of the diocese, so the situation is subject to unpredictable variables. Over the course of five years, Beijing has not conducted any democratic episcopal ordination, but the appointment and ordination of bishops reveal evident signs of being under the full control of local authorities. Such cases include those Msgrs. An Shuxin, Wu Qinjin, and other bishops who were officially installed on the initiative of local authorities, following the consent of the authorities of the Beijing One Association and One Conference. In recent years, bishops who have been officially ordained have all been chosen by the diocese and Patriotic Association, with the permission of the One Association and One Conference and Registration of State Administration for Religious Affairs, and at the same time with the announcement of the appointment by the Holy See. On the eve of ordination, the decree for the appointment of the Holy Father was read to the clergy, but during the ceremony of ordination or installation, the document of the permission of the Chinese Bishops' Conference was proclaimed instead. The new bishop also had to state that he supported the party and the government who loved the Church and the Homeland, observing the Constitution and the laws ... At the same time, legitimate bishops and illegitimate bishops took part in the ordinations, while the ceremonies were previously prepared in detail by the official authorities to ensure a perfect execution down to the last detail[i]. In the context of the many and strong rumors of an agreement reached in the negotiations between China and the Vatican, the two Cardinals of Hong Kong, emeritus Cardinal Joseph Zen Ze-kiun and the ordinary bishop Cardinal John Tong Hon have published their different comments: the first illustrating his pessimism and disappointment, the second some optimism. China's semi-official cultural circles hastened to visit the Vatican and exchange contacts in the form of friendship. But the news that is spreading today is that the negotiations between China and the Vatican have faltered. They are preparing to continue them with the change of stakeholders. From another point of view, Msgr. Ma Daqin’s gesture led to him being considered a good mascot for the Church in China, and he attracted renewed interest in the unofficial Church. But last year the bishop published five articles, in which he reflected deeply on his impetuous action five years ago and humbled himself with a public retraction. During these five years, an underground priest Yu Heping died of suspected drowning, An elderly bishop for a long time under house arrest, Msgr Shi Enxiang died in detention. At least two bishops and a number of clandestine priests are frequently detained, taken away and pressured to enter the Patriotic Association of the official Church. Yet all these facts seem to be ignored by everyone, because they are enamored by the news that the day of the possible diplomatic agreement between China and the Vatican is near. Neither has the Holy See uttered a word or even an appeal on behalf of their situation: they seem to have become the vulnerable group to be rejected. Meanwhile, some dioceses in the nation are divided into factions, some of which are considered 'faithful' to the unofficial Church. This phenomenon can be seen in areas of Fujian and Hebei. The case of the priest who was already suspended, Rev. Paul Dong Guanhua of the Diocese of Zhengding who proclaimed himself a bishop in secret is a particular example of this: it prompted the Holy See to publicly show its disapproval (it seems that the Holy See is no longer worried about Illegitimate bishops who are autonomously nominated and ordained). At present, the official Chinese authorities, in addition to severely enforcing law and promoting the 'Sinicization of Religions', are stepping up their efforts to put some of the unofficial Church's strongholds under control, namely to submit bishops Shao Zhumin, Guo Xijin and other bishops who hold fast to the principles of the Church and force them to bend and adhere to the official Church. Most recently, both in China and abroad, many have been concerned and have protested against the detention and the danger that Bishop Shao Zhumin of Wenzhou finds himself in. In the context of the decade of the Letter to Chinese Catholics of Pope Benedict XVI, two different conferences were held in Rome: the first organized by AsiaNews Agency on 'China: The Cross is Red'. Originally, the Holy See Secretary of State, Card. Piero Parolin was invited and participation eagerly awaited. However, in the end, because of commitments, he could not take part. The General Secretary of the Congregation for the Evangelization of Peoples, Archbishop Savio Han Tai-Fai, gave a lecture during the symposium, in which he emphasized that a "gray pragmatism" is spreading in the Church in China (an archbishop who is a supporter of this line of gray pragmatism and who is close to the government, but who has not yet been officially recognized, even thinks that the faithful Church needed this in the past, but now the circumstances have changed, but the unofficial Church still exploits the flag of fidelity. 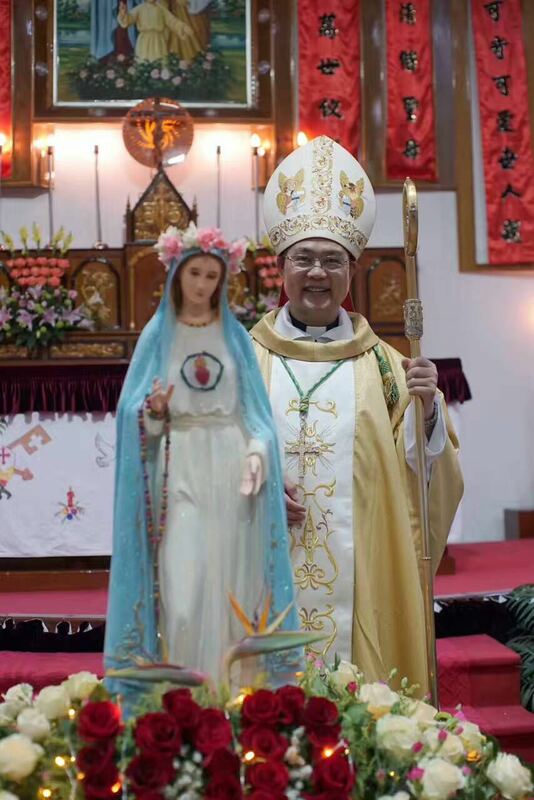 "For the words and actions of that archbishop, the clerical faithful of Zhejiang and Hebei do not go to his church to receive the sacraments, especially since he exhibited the Patriotic Association membership). In another symposium, organized by the St. Egidio Community on the subject of trade between China and the Vatican, the representative of the Chinese party received strong applause for his speech on the 'Sinicization of Religions from a historical point of view and the present situation' . In general, any agreement reached in the negotiations between China and the Vatican can be good, but the fate of the unofficial Church is still in an uncertain state with possible variables. With regard to fears, what many people worry about is that the spiritual foundation of faith no longer centers on the Lord, but unconsciously without realizing it, [the center] becomes the concern about the problem of 'giving God what is of God and give Caesar what is of Caesar'. As for Shanghai, for the Jiangsu clergy and faithful, the current situation is causing confusion and concern. It is hoped that the Holy See can clearly express an appropriate concern for Msgr. Shao Zhumin and the future of the entire unofficial Church and strive to resolve the problem that the 30 or more bishops of the underground Church, which are not recognized by the government, receive the right recognition and this not only through secret negotiations. In addition, 'gray pragmatism' and secularization, which are corroding the Church in China, are problems that require greater consideration. [i] An example were the episcopal ordinations in Chengdu and Xichang , last November and December.